Tracey Promotes Season 2 of "Tracey Ullman's Show" in the US! 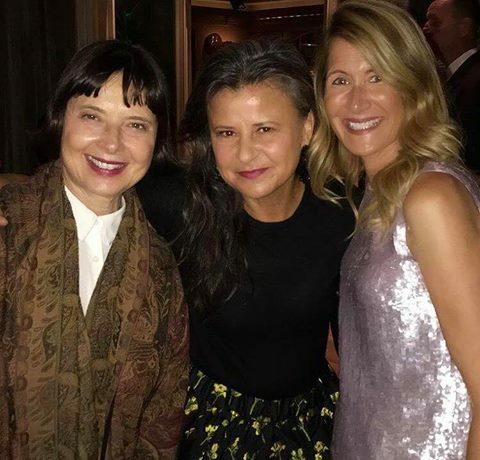 Tracey was making the rounds promoting the second season of "Tracey Ullman's Show" in the United States this past week. She talked to Leonard Lopate on Thursday. And she even made time for an HBO Instagram Live chat appearance. She will continue making appearances this week with Marc Maron's WTF podcast on Monday, and Bravo's Watch What Happens Live with Andy Cohen on Tuesday. Catch the second season premiere of "Tracey Ullman's Show" October 20th at 11pm on HBO! "Tracey Breaks the News" Premiere Date Confirmed! 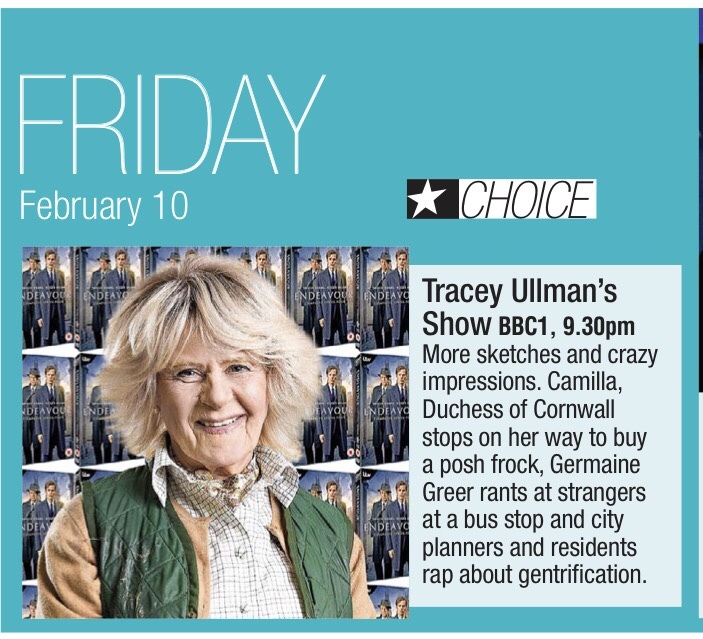 Following a hugely successful election special in June, award winning actress, impressionist and comedian Tracey Ullman is back with three more episodes of Tracey Breaks the News. Filmed close to transmission, the topical format allows Tracey’s huge range of characters to react to the news of the moment. 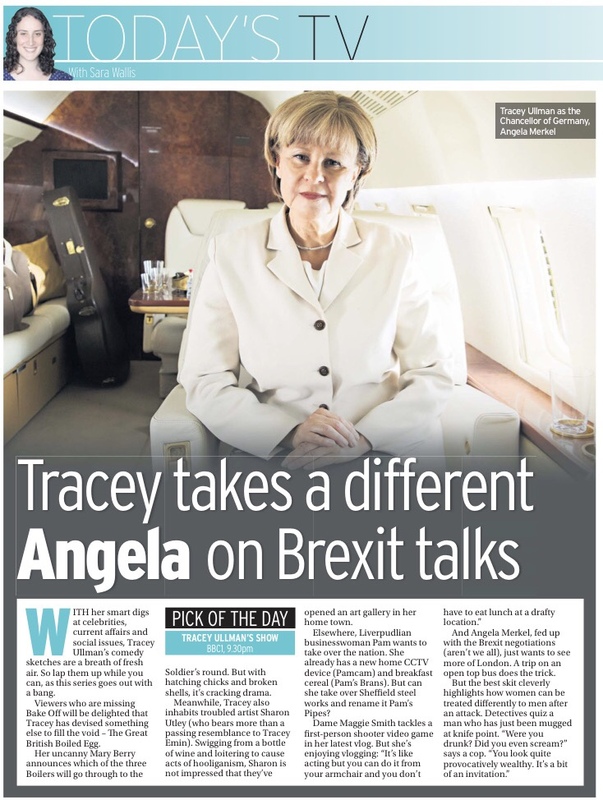 This time, Tracey Breaks The News will include the return of favourite characters Angela Merkel, Nicola Sturgeon, and Theresa May, whilst Brigitte and Emmanuel Macron make their debut. And, for the first time, Tracey will also take on an impression of Jeremy Corbyn. It is produced by Caroline Norris, directed by Dominic Brigstocke and the Executive Producer is Gareth Edwards for BBC Studios. "Tracey has given me a terrible reputation (laughs). She’s very clever [...] I think she knows I’m a huge fan of hers. She’s absolutely amazing. I’ll give her a good slap when I see her (laughs)." Tracey will be on Marc Maron's podcast WTF with Marc Maron October 16th. Tracey with Isabella Rossellini and Laura Dern at the HBO Emmy Party at the Four Seasons Hotel Los Angeles. "Tracey Breaks the News" Series 1 Update! Filming commenced on series 1 of Tracey Breaks the News yesterday! Three new episodes will air soon on BBC One! 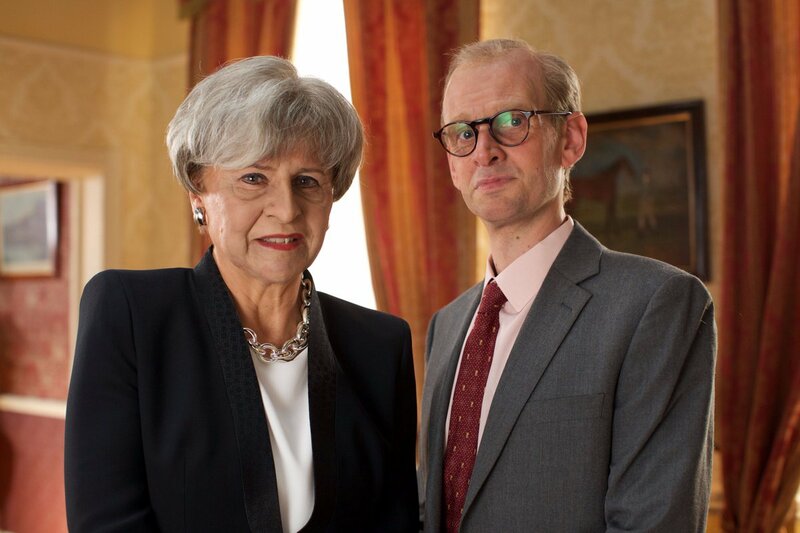 Photos: Tracey Ullman, Rory Lindsay; Tracey Ullman (Credit for all: Ben Miller/HBO). A longtime HBO favorite returns with six new episodes of her Emmy®-nominated series when TRACEY ULLMAN’S SHOW kicks off its second season FRIDAY, OCT. 20 (11:00–11:30 p.m. ET/PT), exclusively on HBO. 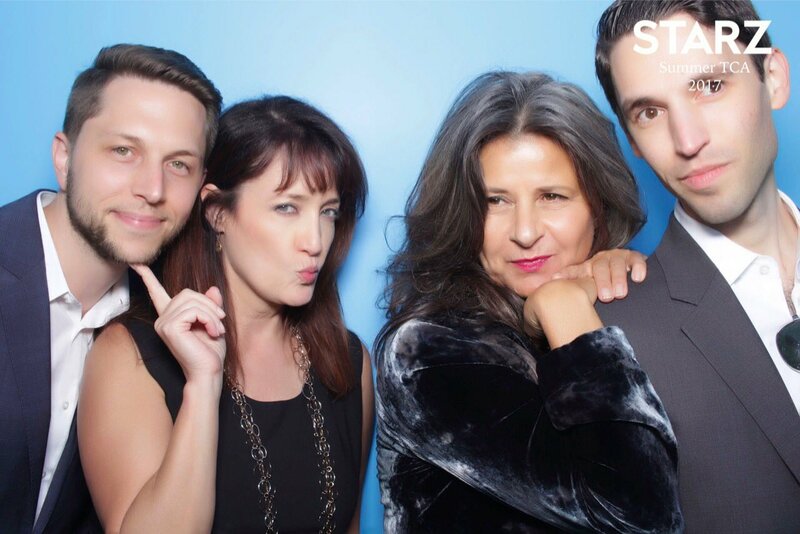 Emmy® winner Ullman stars as a wide array of famous faces and everyday people in the sketch comedy show, which looks at modern life on the British side of the pond. Over the course of the new season, Ullman uses her signature brand of sharp satire to shape-shift into a range of public figures and offbeat original characters. 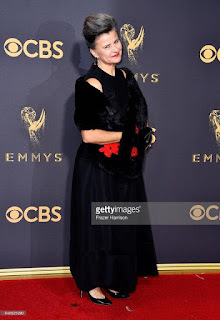 She reprises her characterizations of Dame Judi Dench, German Chancellor Angela Merkel, Dame Maggie Smith and Camilla, Duchess of Cornwall, and introduces her takes on model and new Murdoch family member Jerry Hall and pop singer Adele. Delinquent Dame Judi Dench relies on her “national treasure” status to get her out of trouble; overachieving BBC broadcaster Clare Balding can’t keep herself off-camera; dinner gets dramatic at the Murdoch family home; German Chancellor Angela Merkel sings a heartfelt song to express her loneliness; Doctor Peluzzi practices outside the law when prescribing “medication” for a patient; and Scottish politician Nicola Sturgeon kidnaps a famous British author in service of Scotland. Guest stars include Ben Miller (Rupert Murdoch), Samantha Spiro (Birgit), Colin Salmon (Patricia’s date) and Ricky Champ (police constable). Written by Gemma Arrowsmith, Abigail Burdess, Cicely Giddings, Kevin Cecil, Andy Riley, Jeremy Dyson, Laurence Howarth, Lucy Montgomery and Laurence Rickard; directed by Dominic Brigstocke and Nick Collett. Debut: FRIDAY, OCT. 27 (11:00–11:30 p.m.). 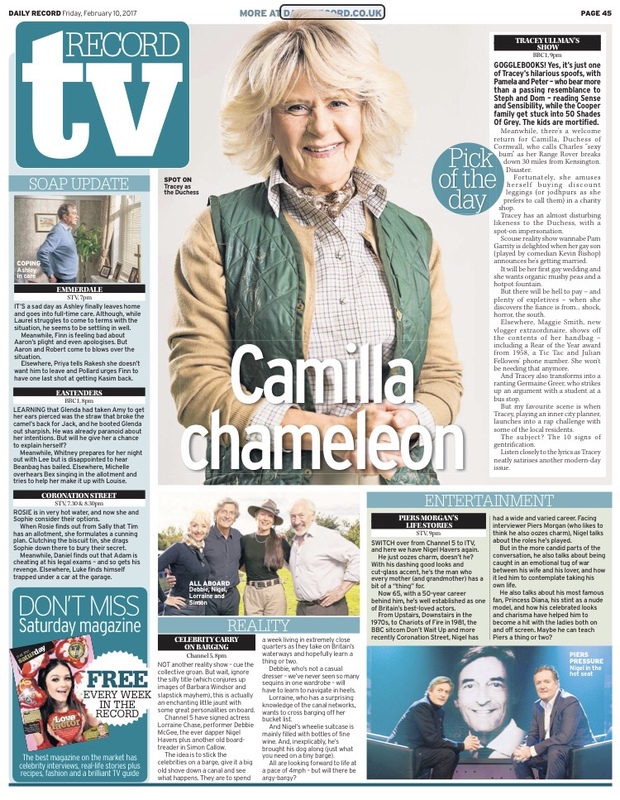 Camilla, Duchess of Cornwall, makes unexpected purchases; a news anchor brings her cats to work; Kay and her elderly mother get caught in a flood, but refuse to leave their home; Dame Maggie Smith starts a YouTube channel; and “Northern Powerhouse” Pam Garrity is less than thrilled when she meets her son’s fiancé. Meanwhile, urban planners enter into a rap battle about the pros and cons of gentrification; feminist icon Germaine Greer rants at a bus stop; and a Murdoch family movie night gets uncomfortable for the kids. Guest stars include Ben Miller (Rupert Murdoch), Kevin Bishop (Larry Garrity), Ben Ashenden (Tom), Joan Linder (Kay’s mother), Jaygann Ayeh (Hassan) and Kadeem Ramsay (Nonso). Written by Gemma Arrowsmith, Kevin Cecil, Andy Riley, Jonathan Harvey, Katherine Jakeways, George Jeffrie, Bert Tyler Moore, Lucy Montgomery and Georgia Pritchett; directed by Dominic Brigstocke and Nick Collett. The series is also available on HBO NOW, HBO GO, HBO On Demand and affiliate portals. Featuring the unique comic talent in multiple roles, Ullman’s first HBO series, “Tracey Takes On…,” ran for four seasons, wrapping its 47-episode run in 1999, and receiving six Emmys®. 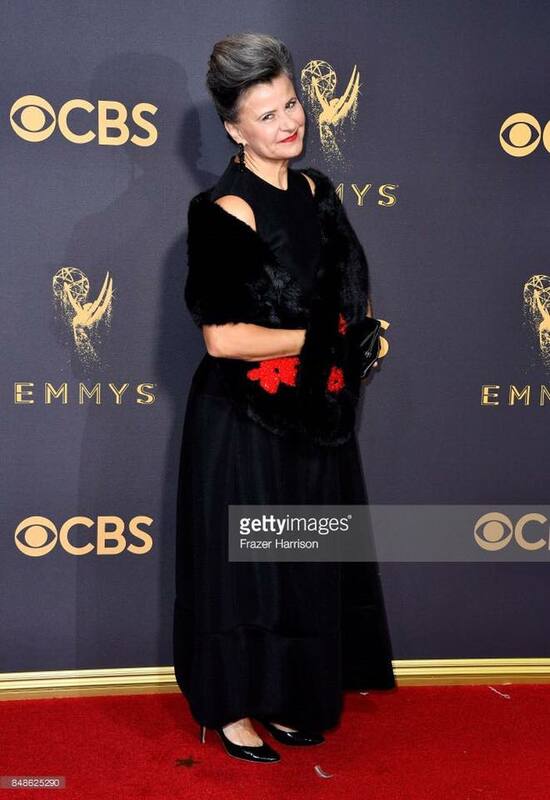 Her other HBO credits include the specials “Tracey Ullman: Live and Exposed” (2005), “Tracey Ullman in the Trailer Tales” (2003), “Tracey Ullman: Takes on New York” (1993) and “Tracey Ullman: A Class Act” (1993). Season two credits: devised by and starring Tracey Ullman; executive producers, Tracey Ullman and Gareth Edwards; producer, Caroline Norris. 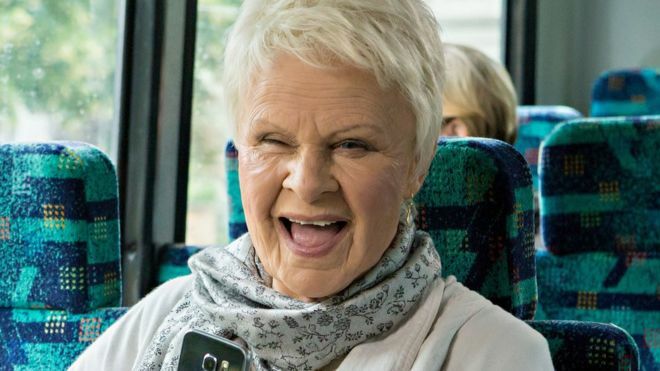 Dame Judi Dench Says Tracey Ullman's Impersonation is More Accurate Than You Think! 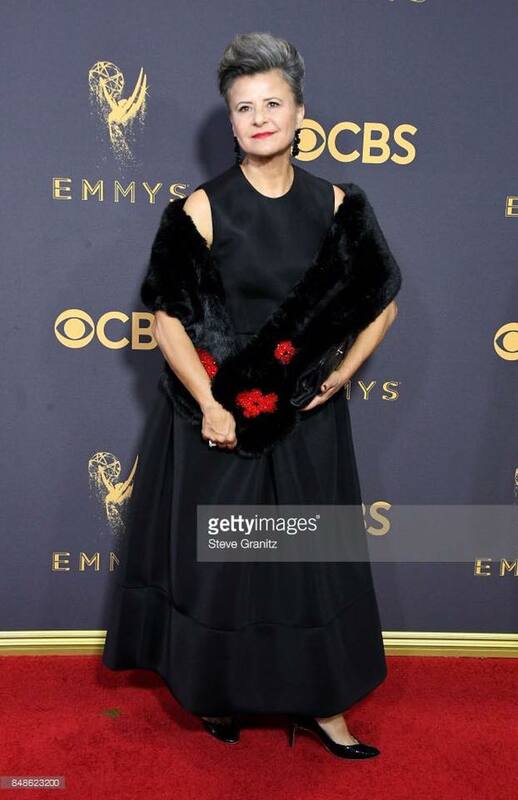 Tracey Ullman's Show returns to HBO Friday, October 20 @ 11pm! Howards End to Air on BBC One This November! We've just gotten word that Howards End will air Sunday nights this November on BBC One in the UK (Starz in the US sometime next year). Tracey stars as Aunt Juley Mund in this four-part series. 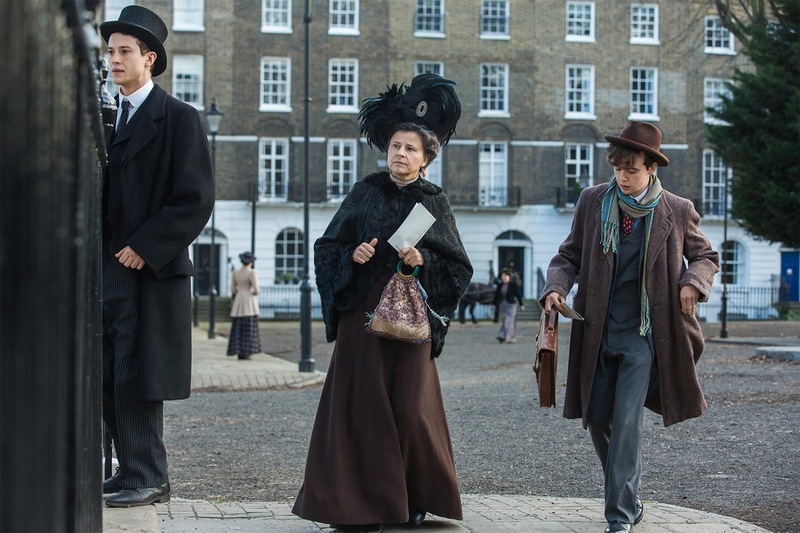 Anticipation is raised high by the creative talent involved in this BBC-Starz adaptation of EM Forster’s 1910 novel about the interlocking romances and scandals of three families. A cast including Hayley Atwell and Joe Bannister performs an adaptation by Kenneth Lonergan, writer-director of the astounding Manchester by the Sea. Get Ready for More Tracey Breaks the News! Expect the new shows in late autumn/early winter this year! Tracey Breaks The News commissioned for a special three-part run. “These are uncertain times, but I have my money on Angela Merkel to win the German election - don’t let me down Angela, you are like my Dot in EastEnders. Theresa May - hang in there, I’m not done with you yet, and Nicola Sturgeon - all power to your elbow hen, I promise my accent will be 10% better this season. “I can’t wait to play new characters including the glamorous FLOF (First Lady of France) Brigitte Macron and a certain Labour leader, who we imagine has a marvellous sense of humour and will no doubt be delighted to see himself depicted by a middle aged woman (please don’t shave your beard off Jeremy, we’ve just had one made). Onward!" On Friday, July 27, 2017, Tracey, along with Hayley Atwell and Matthew MacFadyen, appeared at the 2017 Television Critics Association for Howards End. The four hour four-part series will air on Starz in the US in 2018, and BBC One in the UK (date TBA). Tracey plays Aunt Juley Mund. Tracey said it was lovely being offered something as brilliant as Howards End but said it was hard doing scenes with 20 year olds. Tracey said Mike Leigh crashed the Howards End set because his office was stuck in one of the exterior shots. 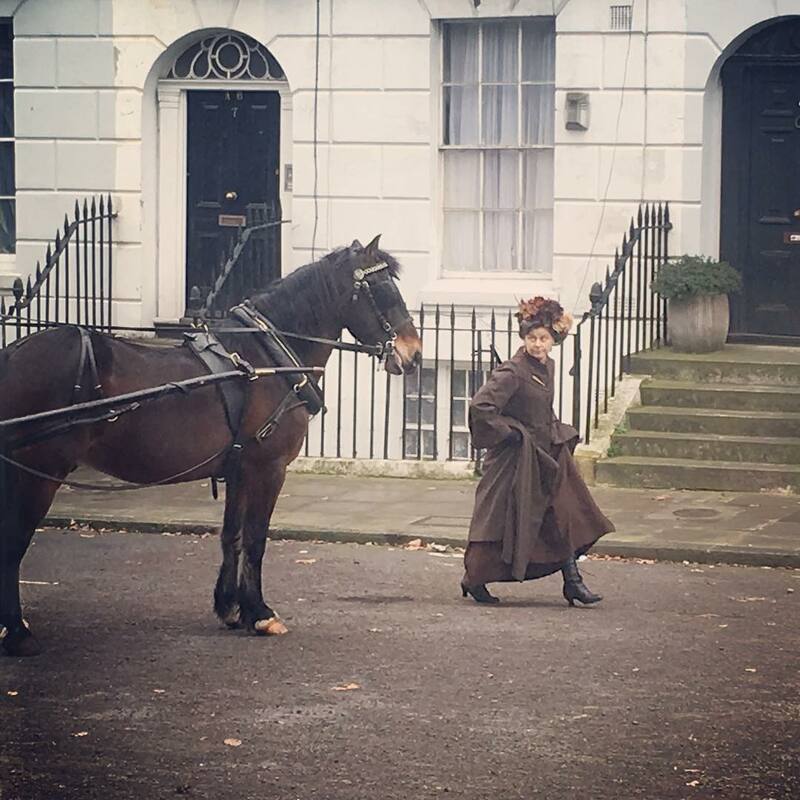 Tracey loved the locations and said that it was like going back in time. Tracey: "The disparity between the rich and the poor is the same. We talked about it a lot. Lonergan's adaptation is astounding." 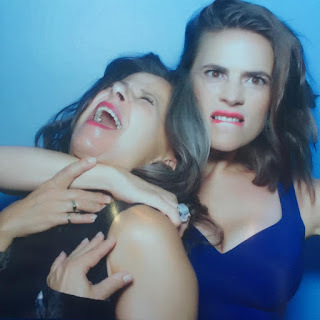 Tracey mentioned that the second season of Tracey Ullman's Show will air on HBO this October "And I'm making 3 more very topical shows when I get back" (to the UK). Tracey said she loves doing topical comedy now and boasted about getting Tony Atamanuik's Trump to talk to her Angela Merkel. Tracey admitted that it's harder for her to act without all her props, wigs and noses. Tracey: "I've gone gray. You can tell I don't live in Los Angeles anymore." Tracey cited Peggy Ashcroft, Judi Dench, Maggie Smith, Jessica Tandy as her idols. Tracey: "I want to be a character actress and work until I'm 90." "Oh it's the best!" said Tracey on Melissa McCarthy's Sean Spicer impersonation on Saturday Night Live, but said whoever did Reince Priebus is out of a job. Tracey: "We look like a failed pilot." TRACEY ULLMAN’S SHOW: Emmy® winner Tracey Ullman returns with a new season of sketch comedy, spotlighting her unique take on extraordinary and ordinary characters in the UK. Returning favorites include delinquent Dame Judi Dench, Angela Merkel on a tourist bus and the long-suffering Kay, with her overbearing mother; new subjects include the home life of Jerry Hall and Rupert Murdoch and a rap battle for the soul of an inner-city estate. The six-episode second season debuts this October. 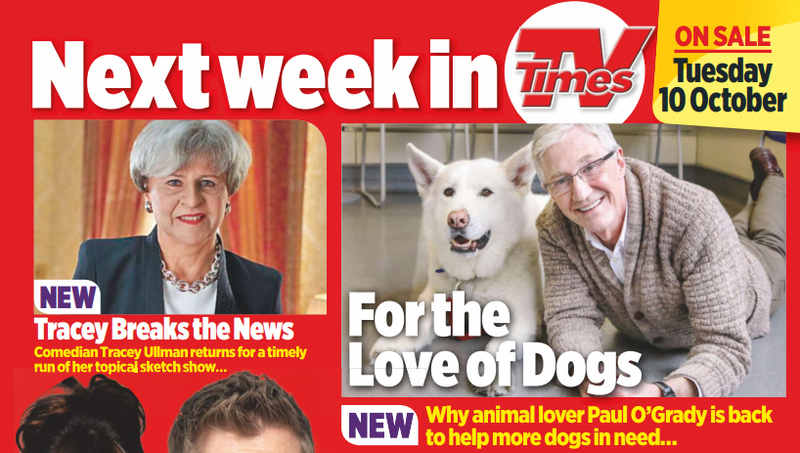 The BBC is already reportedly in talks for a third series of Tracey Ullman's Show according to the Radio Times! Tracey received quite a shock while promoting her latest BBC One comedy special Tracey Breaks the News on The One Show... a response to her impersonation of German Chancellor Angela Merkel from the Chancellor's office! Comedians including Paul O’Grady, Ricky Gervais and Sue Perkins have teamed up with Battersea Dogs And Cats Home to tackle animal cruelty sentencing that they have labelled laughably lenient. 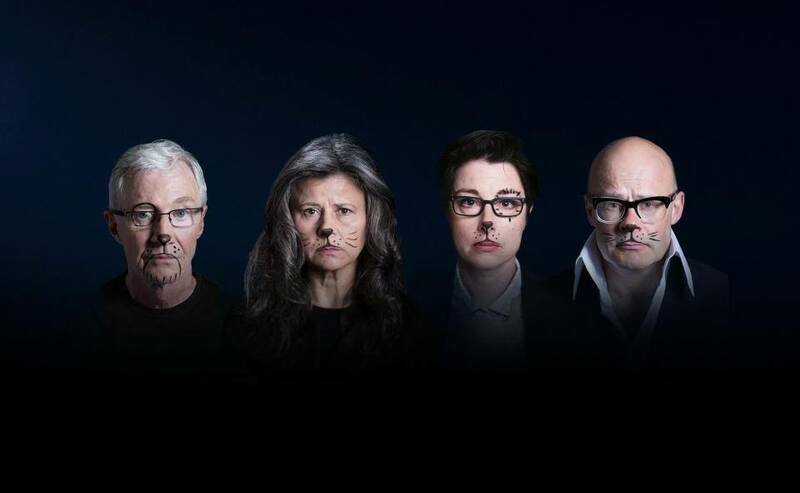 Harry Hill and Tracey Ullman are also backing the Not Funny campaign to increase the maximum sentence for the most severe animal cruelty from the current six months to five years. Under current laws, a heftier sentence could be handed to a fly tipper, which carries a maximum sentence of five years, than to someone who had tortured and killed an animal in England and Wales – where the punishment time is the lowest in the whole of Europe, the USA and Australia. In March this year, a Devon fly-tipper was sentenced to 20 months, while weeks later a Wirral man who admitted stabbing and burning a dog alive was jailed for just 24 weeks. O’Grady, who presents Battersea-based animal series For The Love Of Dogs, said: “There’s nothing like looking into an animal’s eyes to see how innocent and trusting they are, and it makes me angry to see the way some people mistreat and abuse them. “I can’t stand by and watch while those responsible for the most terrible suffering are unlikely to get more than a few weeks in prison. Gervais added: “It’s sickening to hear about innocent dogs and cats enduring terrible suffering at the hands of humans and knowing the law does nothing to protect them, or deter people from committing these acts of cruelty. “Six months in prison is nowhere near long enough for people who choose to abuse, torture and kill animals. Around 34,000 people have already pledged their support to Battersea’s campaign and as the faces of it, the comedians are encouraging their fans to do the same by going to www.battersea.org.uk/NotFunny. 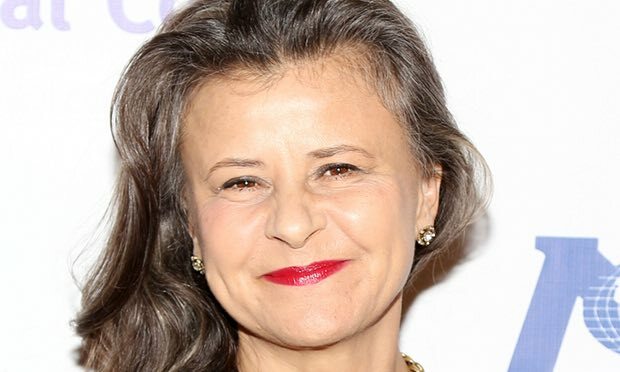 Tracey Ullman's Show Nabs Its First Emmy Nomination! Congratulations to "Tracey Ullman's Show" which just scored its first Primetime Emmy nomination in the category of Outstanding Variety Sketch Series! The 69th Primetime Emmy Awards will take place in Los Angeles on September 17, 2017. Tracey as Theresa May in Tracey Breaks the News! 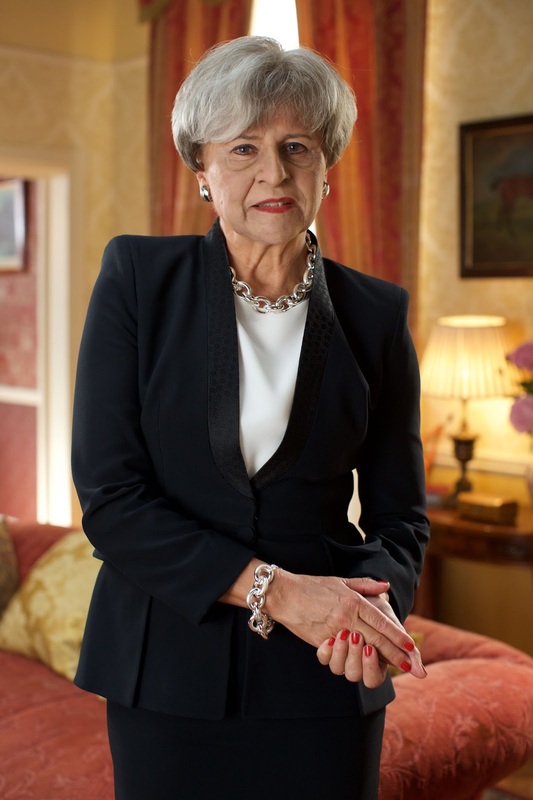 Tracey Ullman's Show writer Laurence Rickard will play May's husband Philip in the special. 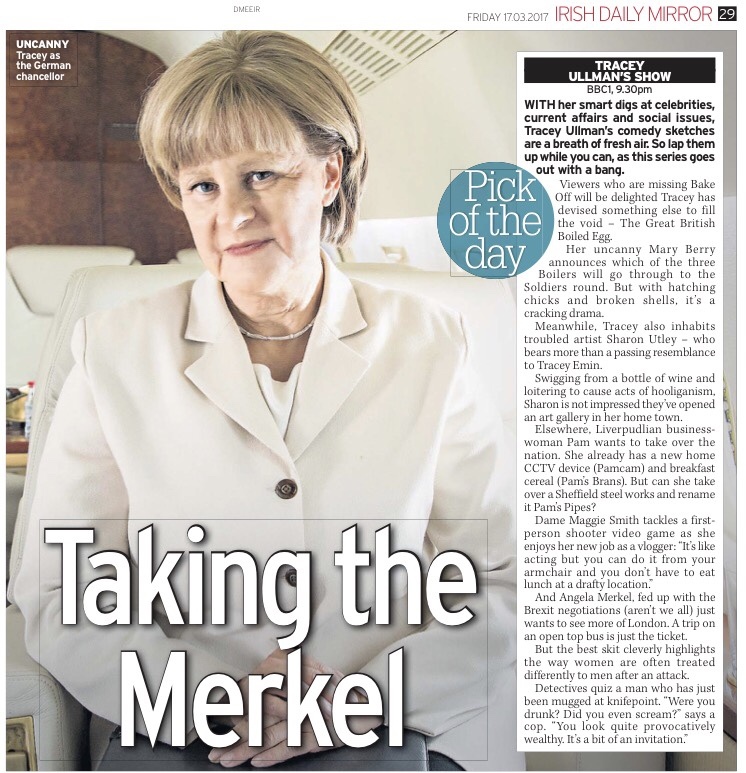 Tracey is expected to play six political figures (Theresa May being one) in the show including Angela Merkel, Nicola Sturgeon, Melania Trump, as well as original characters. Anthony Atamanuik will be playing Donald Trump. The Radio Times confirms that the BBC are already in active talks to bring back Tracey Ullman's Show for a third series for 2018! 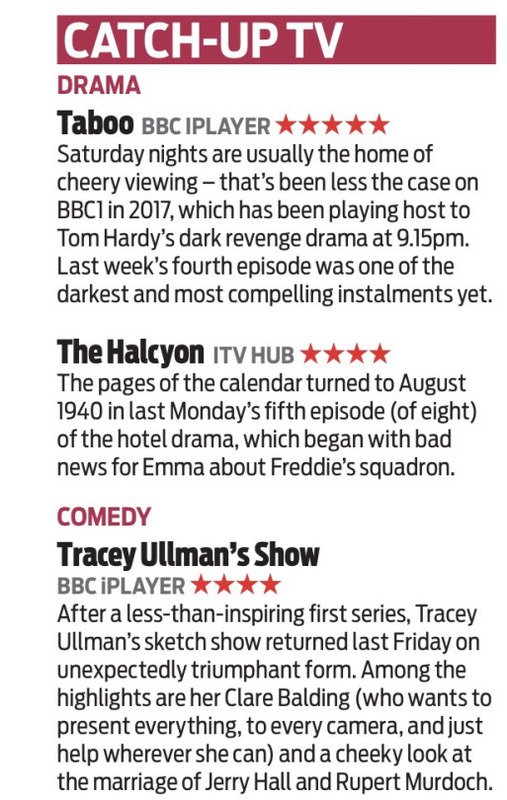 Tracey Breaks the News premieres tonight on BBC One at 9:30pm! 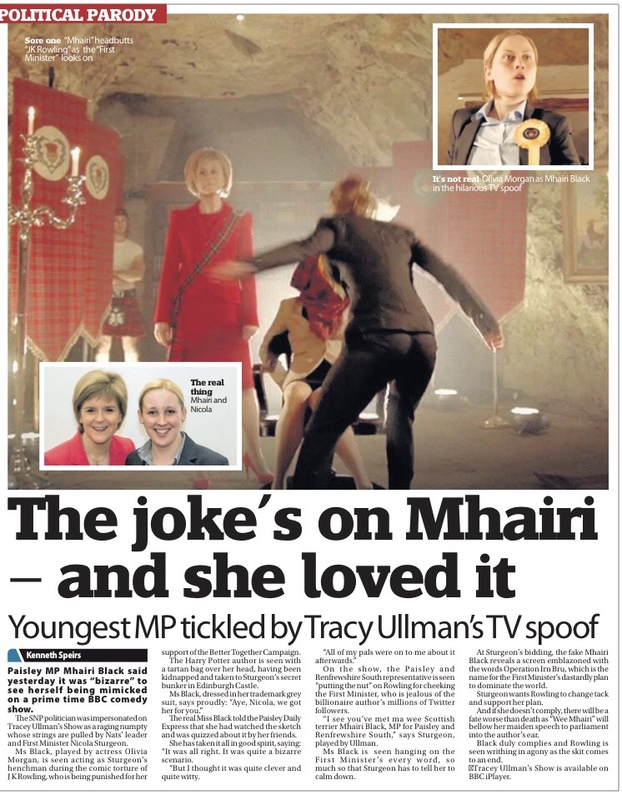 Tracey Ullman as Nicola Sturgeon in Tracey Breaks the News! 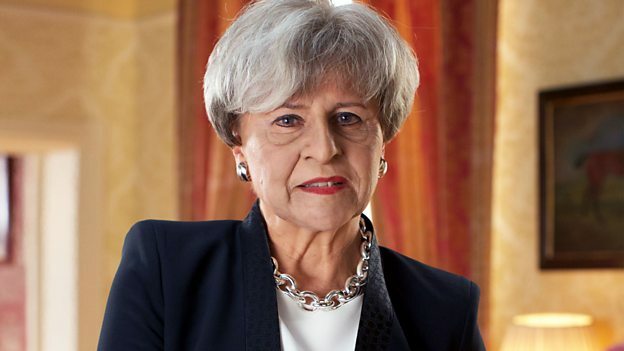 Have you seen Tracey Ullman’s impressions of you on her BBC show? I’ve not seen all of them but I had to watch some because I’ve heard so much about it. I thought it was really funny. Should she play you in our Brexit drama? I definitely think she should! She’s got the outfit and everything! Tracey Breaks The News Gets Release Date! Tracey Ullman is back on BBC One with Tracey Breaks The News, a political and topical offering from the award-winning actress, impressionist and comedian. 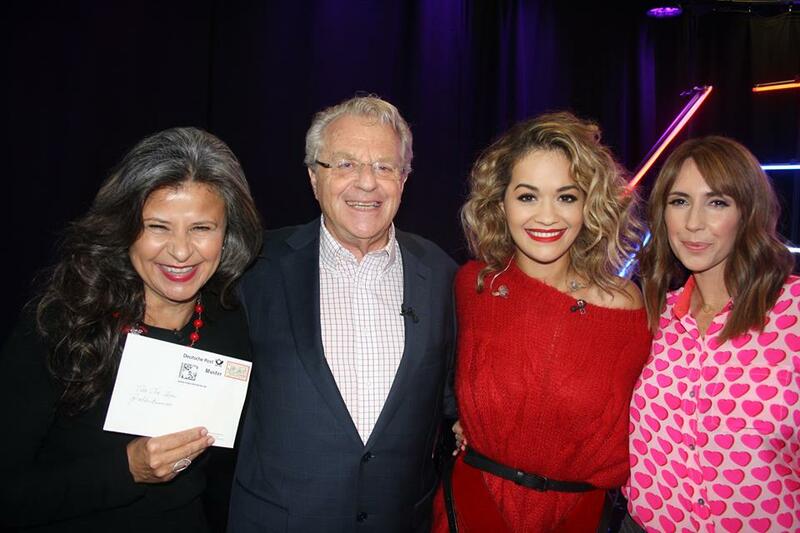 The half-hour special will be filmed close to transmission and broadcast in the aftermath of the general election. For the first time Tracey is taking on an impression of Theresa May, alongside favourites Angela Merkel (pictured) and Nicola Sturgeon. The show is a mix of famous political figures and everyday people reacting to the results of the general election and the anniversary of the Brexit vote. As the election result will have global implications, the show also looks at the reaction of the Russians, Europeans and - Melania Trump. 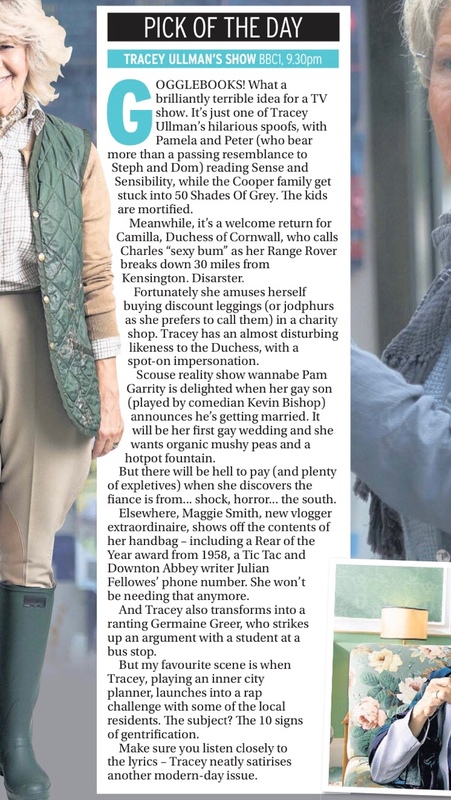 Tracey Breaks the News is a BBC Studios production, produced by Caroline Norris. The Director is Dom Brigstocke and the Executive Producer is Gareth Edwards. Commissioning Editor is Gregor Sharp. This show was included as part of Shane Allen’s recent announcement about a range of satirical shows across all four BBC TV channels. BBC Special: Tracey Breaks The News! Tracey returns this June with an all-new BBC One post-election, post-Brexit comedy special! Shane Allen, Controller, Comedy Commissioning today announces a raft of brand new satires across all four BBC TV channels, featuring an extraordinary range of comedic talent including Tracey Ullman, Charlie Brooker, Frankie Boyle, Diane Morgan, Luisa Omielan and Rhys Thomas. Shane says: “This range of shows puts a contemporary spin on the decades’ long, rich tradition of satire on the BBC. In a tumultuous political climate, the desire and opportunity for satire is at an all-time high. 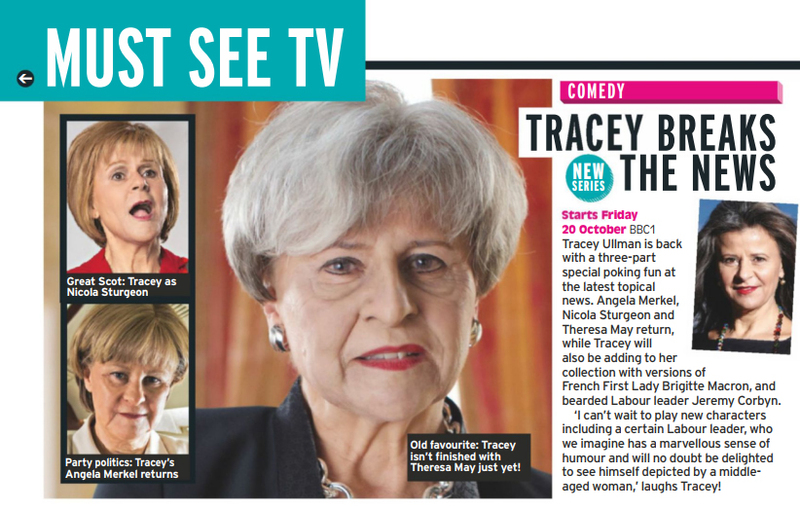 Following a triumphant return to the BBC and two successful series of Tracey Ullman’s Show, the award-winning actress, impressionist and comedian is back on BBC One with a half hour special to transmit in the aftermath of the election. 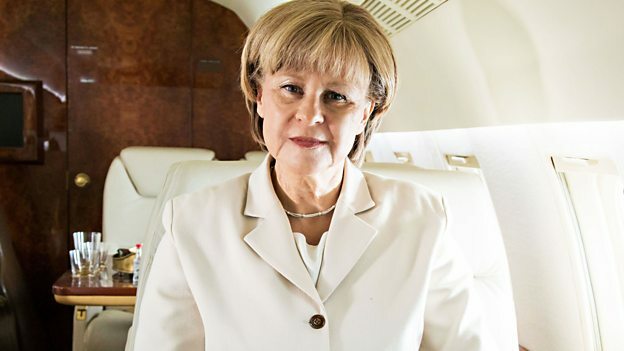 Tracey Breaks The News (1 x 30’) will be filmed close to transmission, and will feature the return of series favourites Angela Merkel and Nicola Sturgeon. And Tracey will also be tackling Theresa May for the first time. The show will be a mix of famous political figures and everyday people, all reacting to the aftermath of the general election and the anniversary of the Brexit vote. It’s no longer just a view of the UK – this show will feature Russians, Europeans, and a new take on Melania Trump. Tracey Ullman: “I'm excited the BBC has asked me to make a show at this time. We've decided to shake it up with a more topical format because things move so fast these days it's like every 10 minutes I'm voting for something. 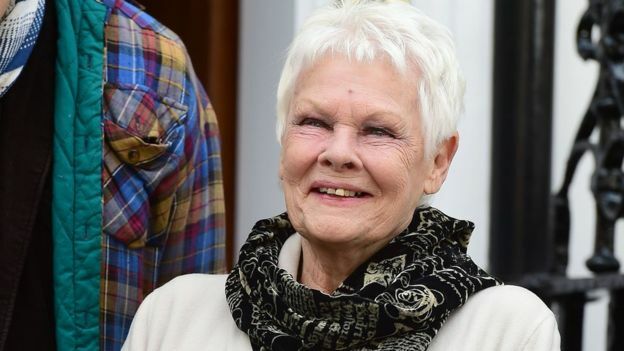 Dame Judi Dench has declared herself a big fan of comedy sketches that show her using her fame to get away with shoplifting and other petty crime. Tracey Ullman played Dame Judi last year as a nefarious national treasure - stealing, smashing china in a boutique and hurling bags of dog poo into trees. 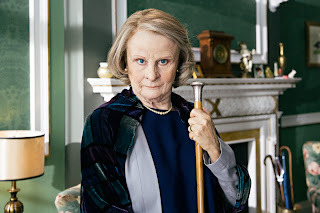 Speaking to BBC Radio 4's Front Row about Ullman's portrayal, she said: "I love it. I dote on it. "But I get into trouble now if I go into a shop with a bag over my arm." Ullman is "brilliant", the actress said - but joked that the sketches in the BBC One comedy show have caused problems. "It's tricky, people look at me in a funny way," she said, adding: "A man came up to me in M&S the other day and said to me, 'I've got my eye on you'." Dame Judi was speaking as she unveiled a blue plaque for her friend, the late actor Sir John Gielgud, at his former London home. She told Front Row that Sir John was one of the greatest Shakespearean actors and that young actors would do well to learn from his performances. She said: "He used to present the whole of a sentence, the whole arc of a sentence, or the meaning of a passage of Shakespeare. "We're in an unfortunate century where people think, 'oh Shakespeare, it needs to be changed because we don't understand what things mean'. That's not so. One can understand it and John was sublime at being able to tell you exactly what it meant." Born in Slough, Tracey Ullman, 57, won a scholarship to stage school at 12. She made her name in British TV comedy, before moving to the US, where she had an award-winning series, The Tracey Ullman Show, from 1987 to 1990. Her film roles include Robert Altman’s Prêt À Porter and Woody Allen’s Small Time Crooks. 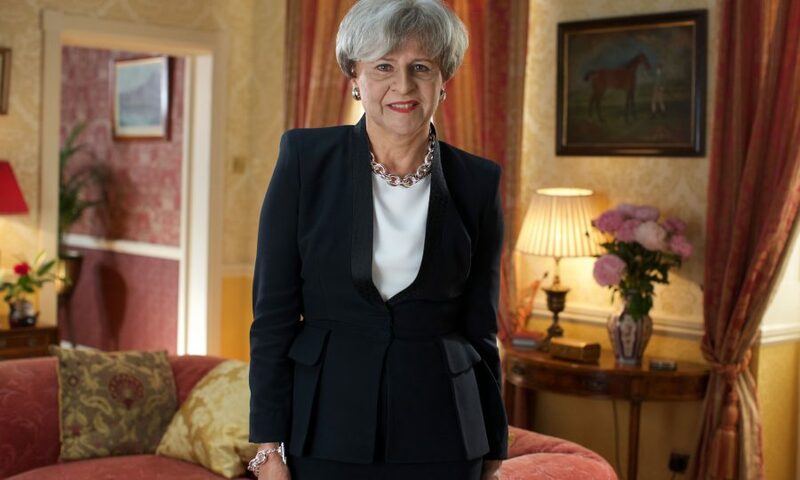 Her latest series, Tracey Ullman’s Show, is on BBC1. She is widowed, has two children and lives in London. When I met my husband and had babies. They have made me happy ever since. I am not fearful. There’s no point. Sticking a pencil in my ear and the lead falling off. Judging people too quickly. I think I’m so bloody smart, and I’m not. Well, sometimes I am. Having no sense of humour. The ring my husband gave me for our 25th wedding anniversary. To fly very quickly between LA and London to see both my children. Emily Blunt, though she’s too pretty. What’s your most unappealing habit? My daughter just suggested “talking over people”. I drowned her out. Frozen dark chocolate and two Veganin (paracetamol with caffeine and codeine). I did a crap impersonation of JK Rowling a few years ago. Sorry, JK. Can this apology put me on a casting list for your next mega-franchise? Kevin Kline in I Love You To Death. He trained at Juilliard, so is technically brilliant. Realising as I grew up that people don’t really know what they’re doing. I would have stopped making records after They Don’t Know. I knit and watch documentaries. On a plane with Meryl Streep in 1984: the engines blew and we had to make an emergency landing. The End by the Beatles. That life is short, but it’s also long. Comedian Tracey Ullman tackled the double standard many women face when reporting sexual assault in the latest episode of her BBC One show, taking aim at the unfair way responsibility is often shifted onto victims. When a well-dressed man tells Ullman, who plays a detective, that he was mugged at knifepoint, the comedian begins investigating his outfit. “You look quite provocatively wealthy. ... Just a bit of an invitation, isn’t it? Like you’re advertising,” she says with little sympathy. Ullman has even less empathy for a man who went to the station to report he’s been receiving threatening emails for months. The video, posted to Facebook on Sunday, clearly resonated with audiences: It has more than 9 million views and more than 215,000 shares. “Guys, is dressing provocatively in expensive suits whilst having too much much to drink causing you to get mugged?” the caption of the video asks. Watch the hilarious sketch in the clip above. EXCLUSIVE: Starz has teamed with BBC to co-produce the limited series Howards End, based on the classic E.M. Forster novel with Oscar-nominated Manchester by the Sea screenwriter Kenneth Lonergan writing the TV adaptation. 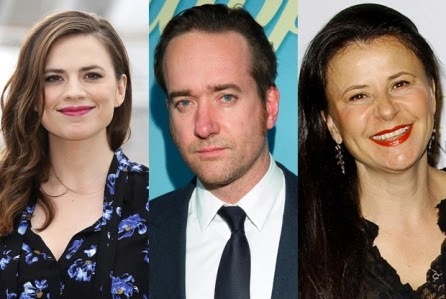 Hayley Atwell (Agent Carter), Matthew Macfadyen (Ripper Street) and Tracey Ullman (Tracey Ullman’s Show) have been tapped to star in the project, originally greenlighted by BBC One in December 2015. Hettie Macdonald (White Girl) will direct the four-part series that will air on BBC One in the UK and Starz in the U.S. Howards End will film in and around London. Howards End explores the changing landscape of social and class divisions in turn-of-the-century England through the prism of three families: the intellectual and idealistic Schlegels, the wealthy Wilcoxes from the world of business and the working-class Basts. Playground is executive producing in association with City Entertainment and KippSter Entertainment. Atwell will play Margaret Schlegel, Macfadyen will portray Henry Wilcox, and Ullman will play Aunt Juley Mund. 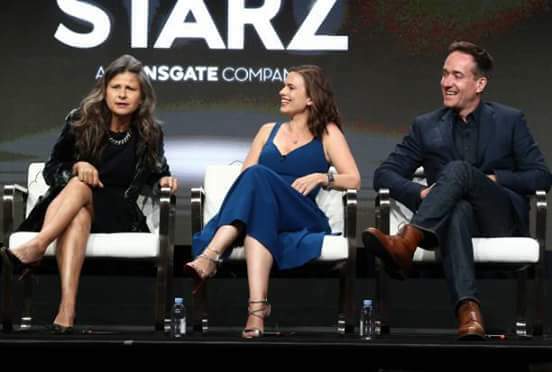 “Starz continues our commitment to bring quality drama to the screen with Howards End, and we’re delighted to once again work in partnership with the BBC and Colin Callender on this literary period piece,” said Carmi Zlotnik, President of Programming for Starz. Callendar also is producing The Missing and The White Queen franchise for Starz — both back for second installments. He executive produces Howards End with City Entertainment’s Joshua D. Maurer (Papillon) and Alixandre Witlin (The Last Tycoon) and KippSter Entertainment’s David A. Stern (The Last Tycoon) as well as with Playground’s Sophie Gardiner (Eureka Street) and Scott Huff (The Missing) and Lucy Richer for the BBC. Laura Hastings-Smith (Hunger) is producing. 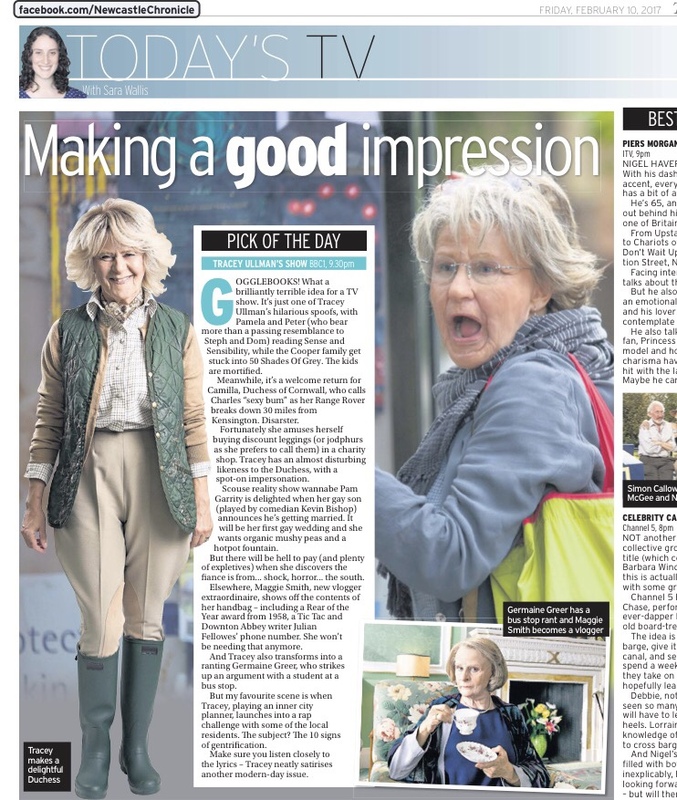 Daily Record and Newcastle Chronicle Review Tracey Ullman's Show Series 2, Episode 2! 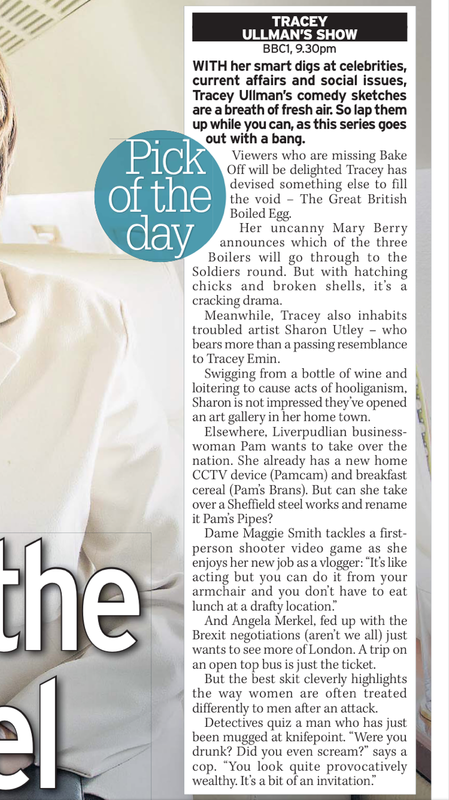 Daily Mirror, Preview of Tracey Ullman's Show, Series 2, Episode 2!